Thanks to help from Frank Paysen for making today's climb possible! 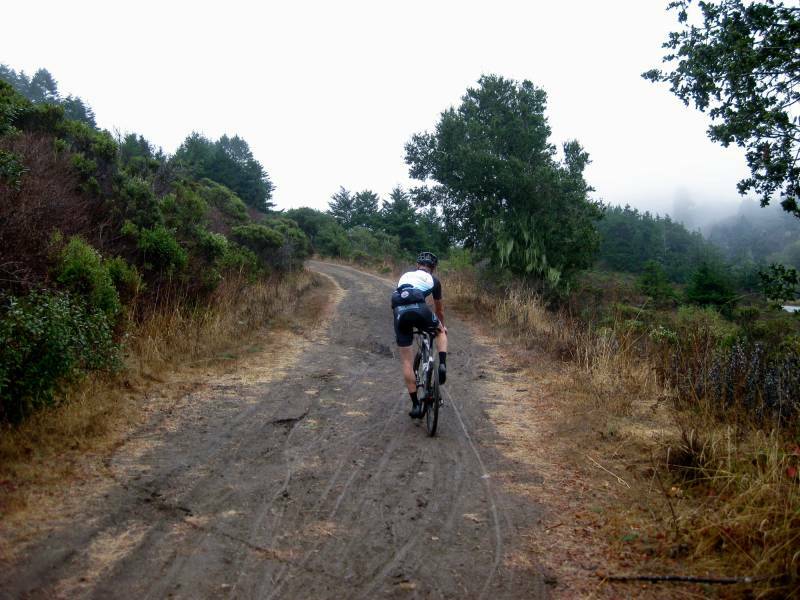 San Francisco Bay area riders don't have the reputation for being the most intrepid when it comes to riding in damp conditions. But Low-Key proved the exception this week, with 28 riders finishing, multiple others starting the climb and succumbing to the conditions along the way. It was truly a week for the "hard men and women", and Low-Keyers rose to the challenge. Among the women it was, for the third week in succession, Jennie Phillips (SAMONM) at the top of the leader list, with Shaena Berlin (Easy Riders) not far back in second, and newcomer Diniana Piekutowski (Stanford) showing her MTB skills to finish third. In the men, it was Chris Peck (CCAP) edgeing out David Collet (Easy Riders) with Justin Morgan (Veldrijden hup hup) a bit back in third. But this is a week that transcends the results sheet. Truly all finishers today should assertively pat themselves on the back for a job well done. It was a week of surviving more than thriving. And all the riders here accomplished that. Thanks to everyone who participated, making week 3 a surprisingly strong Low-Key Hillclimbs success!! !